Presidential candidate Fabricio Alvarado gives a thumbs-up as he’s surrounded by the press at a polling station, San Jose, Costa Rica, Feb. 4, 2018 (AP photo by Arnulfo Franco). Costa Ricans headed to the polls last Sunday amid an unusually heated campaign that few had foreseen and even fewer dared to predict. Following the Feb. 4 vote, Fabricio Alvarado of the conservative National Restoration Party and Carlos Alvarado of the leftist Citizens’ Action Party, or PAC, which has been in power since 2014, are headed to a second round on April 1. 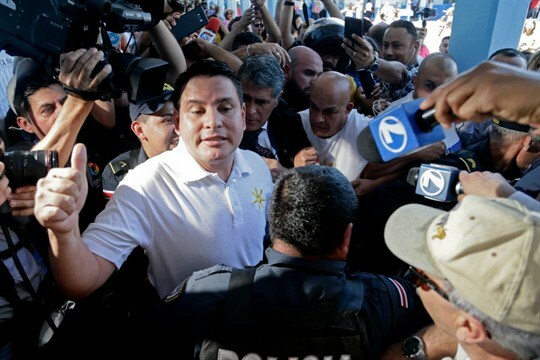 No presidential candidate came close to securing the 40 percent share of the vote required to avoid a runoff, underscoring the increasingly fragmented political environment in what has been Central America’s most stable democracy.